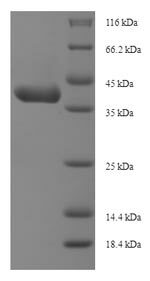 Biological_Activity The ED50 as determined in a cell proliferation assay using Balb/3T3 mouse embryonic fibroblast cells is less than 300 ng/ml. Function Growth factor that plays an essential role in the regulation of embryonic development, cell proliferation, cell migration, survival and chemotaxis. Potent mitogen for cells of mesenchymal origin. 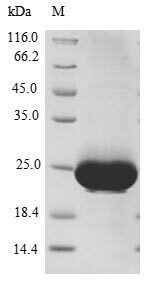 Required for normal lung alveolar septum formation during embryogenesis, normal development of the gastrointestinal tract, normal development of Leydig cells and spermatogenesis. 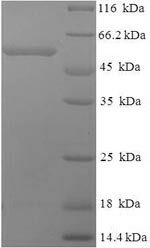 Required for normal oligodendrocyte development and normal myelination in the spinal cord and cerebellum. Plays an important role in wound healing. Signaling is modulated by the formation of heterodimers with PDGFB (By similarity).